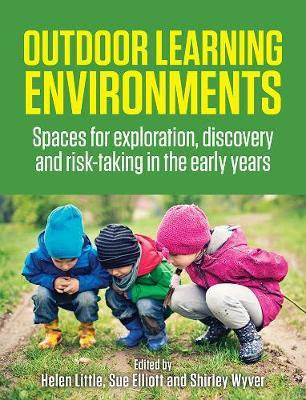 Outdoor Learning Environments: Space for exploration, discovery and risk-taking in the early years is a book written for educators but is equally useful for parents. This book outlines how outdoor learning environments contribute to a child's physical and mental development, interdependence, resilience, emotional understanding and ability to appraise risks in their environment. Outdoor Learning Environments helped me reflect on the quality of the outdoor play environments that children in my care experience. The book explains the variety of spaces that children require to be able to climb, travel at speed, dig, role play, connect with nature, meet friends, feel secluded and experience play in all weather conditions. The experts in the book explained some of the reasoning behind why children in countries like Australia have reduced opportunities for free outdoor play. Today many Australian children live in built environments where disruptions for outdoor play have occurred. While Australians believe that outdoor activities are important there is a bias towards restricting outdoor activity due to safety and weather exposure. Myths have developed around laws regarding children's independent mobility to get to school, parks and friend's houses. Additionally contemporary children are considered as vulnerable people and hence adults and regulations have increased the requirements for monitoring of children during outdoor play. The book made me think about my style of parenting. Do I have a conservative approach about risk taking? Am I helicopter or cotton wool parent? Do I provide a balance between autonomy and safety when it comes to free outdoor play? Outdoor Learning Environments presents research, case studies, tables and information about Australian Playground and Equipment Standards regarding the design and planning of outdoor playgrounds. It highlighted the need for open spaces that allow for group activities to places that allow for quite imaginative play. The book included guidelines for the creation of outdoor spaces that challenge children's motor skills and increase their social skills. It was encouraging to read about opportunities that are being provided to children to connect with the natural world. Some opportunities occur in programs like Stephanie Alexander's Kitchen Garden, On Country Learning for Indigenous children and Bush/Forest Schools. These outdoor learning environments promote a child's participation in the community and encourage discussions about sustainability and culture. Finally, the Outdoor Learning Environment made me consider the quality of outdoor learning environments that I have experienced with children in the past. It helped me think about what to look for in the environments that I expose children to in the future. It has given me more confidence to ensure that the children are challenged in their outdoor learning environment to take risks so they can grow into a more capable child and adults.